Billionaire philanthropist David Rockefeller, former head of Chase Manhattan Corp and patriarch of one of the most famous and influential American families, died on Monday, a family spokesman said. He was 101. 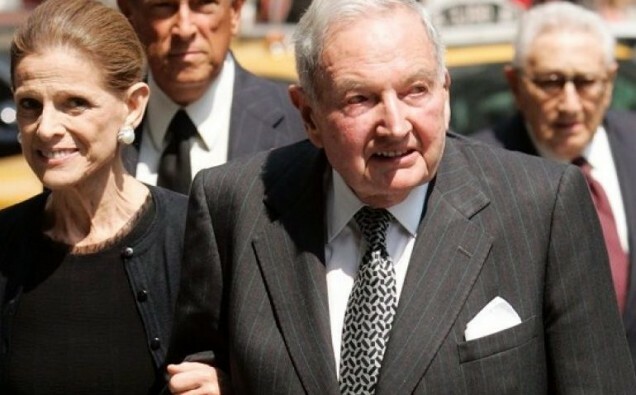 Rockefeller, who reportedly gave away nearly $2 billion in his lifetime, “died peacefully in his sleep” of congestive heart failure at his home in Pocantico Hills, New York, spokesman Fraser Seitel said in a statement. One of the few remaining links to the US “gilded” era of robber barons, he was the son of John D Rockefeller Jnr, who developed New York’s Rockefeller Center, and was the last living grandson of oil tycoon John D Rockefeller, founder of Standard Oil and the family dynasty. He also embodied an era when globetrotting bank chiefs worked with the world’s most powerful politicians. During his time as head of Chase from 1969 to 1981, Rockefeller forged such a network of close relationships with governments and multinational corporations that observers said the bank had its own foreign policy. The Rockefeller name came to symbolise unpopular US banking policies in debtor countries, and Rockefeller was scorned on the left for working with Chile’s Augusto Pinochet and the Shah of Iran. He has been viewed with anger also on the right for pushing to open trade with China and the Soviet Union during the cold war. The Trilateral Commission, a group Rockefeller founded in 1973 to foster relations between North America, Japan and Western Europe, came to be a regular target of the far-right and conspiracy theorists, who said it was trying to create a one-world government. David Rockefeller spent his childhood in New York City and at the family’s estates, and recalled meeting such luminaries as Charles Lindbergh, Admiral Richard Byrd and Sigmund Freud. His ties to the internationally famous continued throughout his adulthood, symbolised by his famed 100,000-card Rolodex, housed in its own room next to his office in Manhattan’s Rockefeller Center. The site of the nine-storey mansion where he was born, then New York’s largest residence, is now part of the Museum of Modern Art, which his mother, Abby, helped found in 1929. Rockefeller’s wife, Peggy, died in 1996. They had six children and 10 grandchildren.